Red lipstick is fabulous and is timeless. It has been here for a really long time and will be here for the rest of the eternity. It is traditionally or classically worn with a LBD or at night during some cocktail parties or special events, but I love to wear red lipsticks a lot and every time, even during the day. I wear red lipsticks with sweat shirts, t-shirts, funky dresses, with patterns and prints and feel like wearing them with pajamas too. Nothing really amps up my mood and boosts my confidence as much as a red lipstick does and I just can’t imagine myself without them. I get many requests from friends and readers to do a “which red will suit me” post. 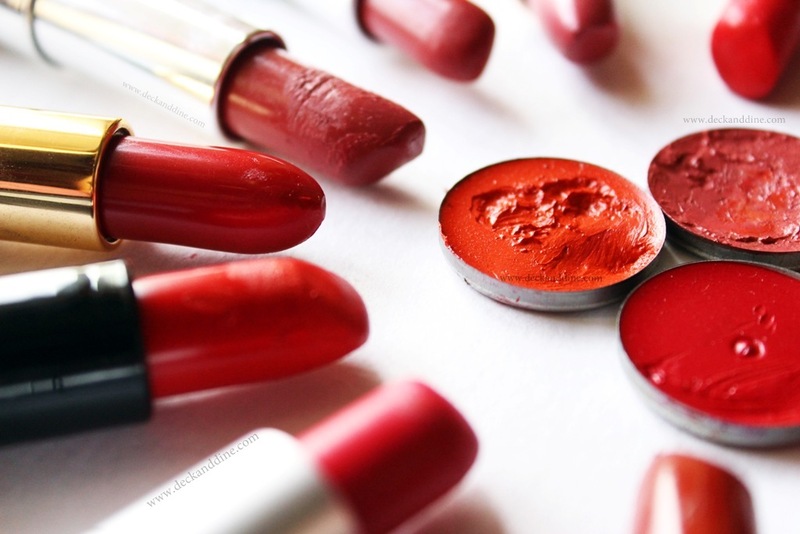 Many people are scared of wearing scarlet on their lips, but I believe red lipstick looks absolutely gorgeous on every one; you just have to choose the right shade, tone that suits you. 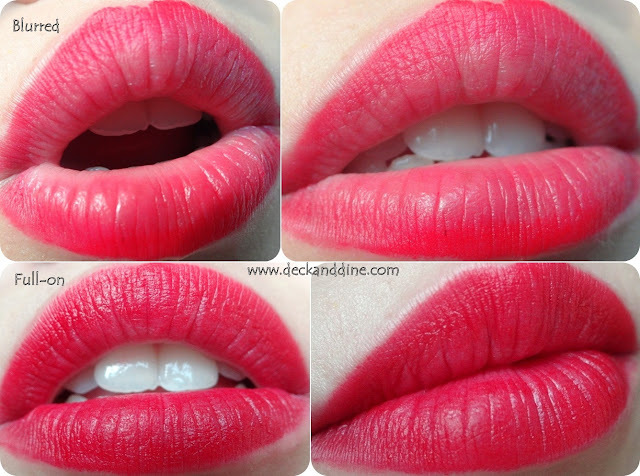 You’ll be amazed to see that how a perfect red pout can transform your whole look. The key is to compliment your skin tone. Know which undertone you are and choose accordingly. Cool Undertone:- If you have a cool/pink undertone, then you need a cool, blue based red. They sit together better and looks amazing. Warm Undertone:- If you have a warm/ yellow based skin tone, then warm, orange toned reds are for you. Neutral Undertone:- Lucky you, if you have neutral undertones, you can wear any red. Remember, there are always exceptions and I have seen for some, wearing a shade according to their tone makes the look so jarring. So always test before buying. As I always say, there are no particular rules in makeup artistry that are compulsory for you to abide by. You can mix and match, wear a totally contrasting red and see if you are comfortable with it. And if you are comfortable, then don’t worry about the ‘rules’. Fair/ Light Skin Tones:- Sheer to bright reds look beautiful on fair skin tones. That doesn’t mean you can’t experiment with darker hues. Medium/Wheatish Skin Tones:- Medium skin tones can carry both brighter and darker red lipsticks. Just keep in mind your undertone. Darker Skin Tones:- If you are not comfortable wearing bright reds and think that they just sit on your lips, jarring and doesn’t work for you, then go for dark reds. Richer shades look absolutely ravishing on dark skinned beauties. I just keep on drooling over how gorgeous dark reds look on richer skin tones. Eg, NARS Red Lizard, MAC Russian Red, Maybelline Refined wine or YSL Red Muse. As I said earlier, Keep experimenting…!! I never really used lipsticks during my teens, it was always a clear lip balm or at max a tinted one. But time has changed and teenagers today love makeup and red lips attract them too. Go for sheer, shiny reds. 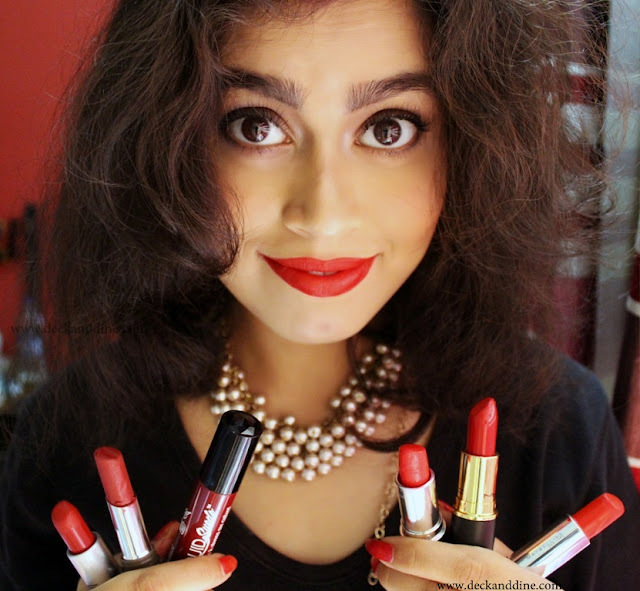 Tinted balms from Nivea, VLCC (Click HERE for the review) and Himalaya are great options; they not only add colors to lips, but will moisturize them too. Color + Care, what else do one need? However, for special occassions you can go for a pinky red lipstick. Stick to tinted balms and colored glosses to add a nice shine to the lips when in hurry or for day time wear. For bolder flush of colors, choose reds which are bright and funky. I prefer pinky and blue based reds for this age group because they don’t add age to face and make your teeth look whiter and face brighter; they are fun, gives a fresh twist to your look. 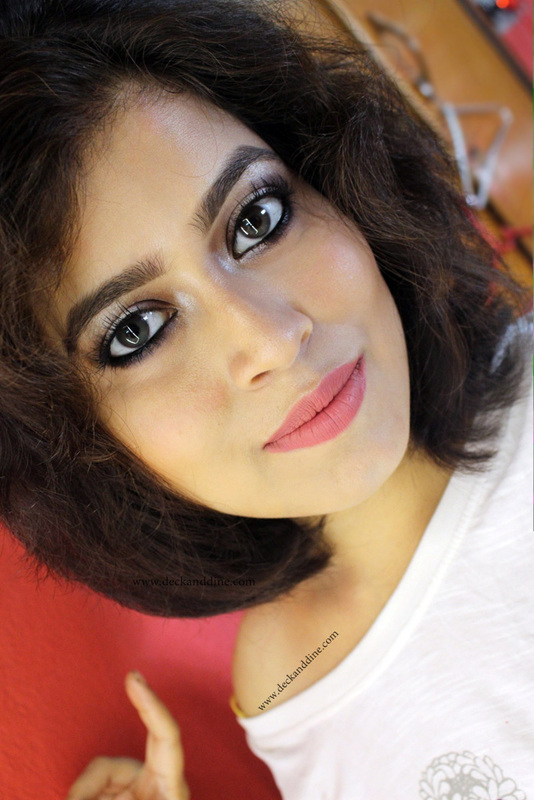 Elle 18 rosy blush, Lakme lip gloss, StreetWear gloss, Lakme lip crayon, MAC Relentlessly Red, Maybelline Lip Gradation Red 2 (Read review HERE) to name a few. This is the time when you should really experiment with red lipsticks. Go bold, beautiful and powerful; chic, flamboyant and feminine. Blazing reds, hot rod reds in varied texture and finishes, from matte to creamy, from cool toned to warm toned, try and mix-n-match to suit the occasion and your mood. I fall in this category and I prefer blazing red in matte finishes. Red lips speak sophistication and matte texture amps up the look even more. Gosh! MAC Ruby Woo, MAC Russian Red, MAC Relentlessly Red, Maybelline Lip Gradation Red 2 (Read review HERE), Maybelline Ravishing Rouge, Chambor Powder matte 157, NYX Suede Lipstick in Kitten Heels (Read review HERE) to name a few. Instead of blue based reds, go for orange reds. Deep, Warm reds add freshness and an instant glow to mature faces. Berry toned lipsticks look alluring as well. 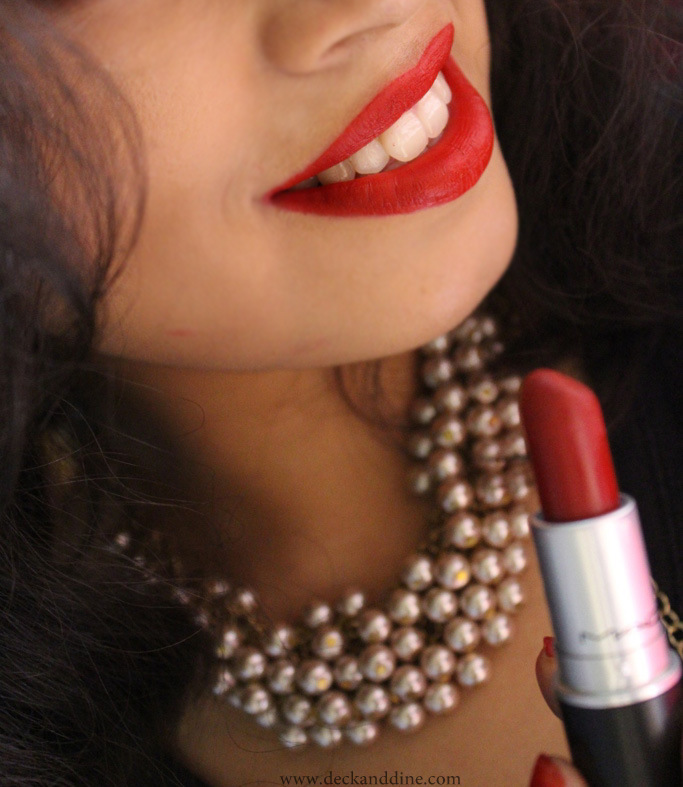 MAC Lady Danger, Colorbar Claret, MAC Chilli, NYX Suede lipstick in Cherry Skies (Read review HERE) are my favorites. Women at this age are often not comfortable with bold red lips. But gone are the days when people used to think that at this age a lot of things need to be toned down. I would definitely recommend going for red lips. Oxblood red, wine red looks classy and so elegant on women in this age group. Berry/Plumy red works wonders too. 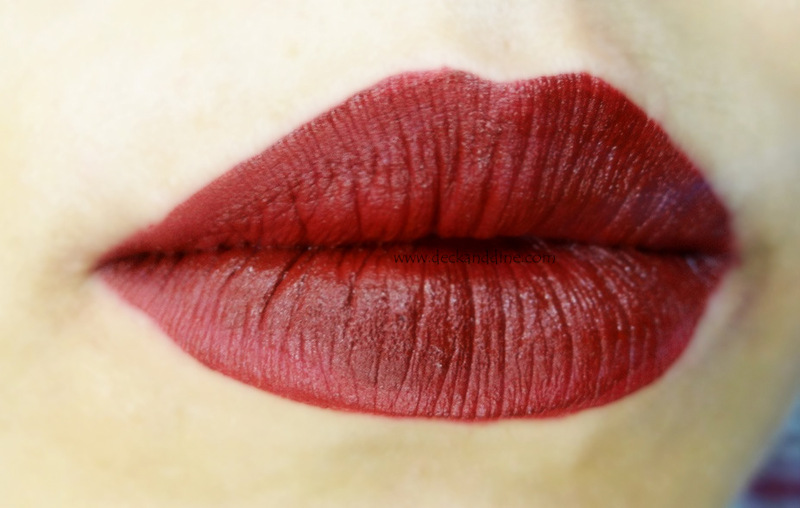 Go for muted brick reds if you want something subtle on lips. Maybelline Refined wine, YSL Red Muse, NYX Suede Lipstick Cherry Skies (Read review HERE), Lakme Enrich Matte RM15 (Read review HERE) are stunning. Red lipstick never goes out of style. Mess around with shades, try different colors and see which one works for you the best. This is just a guide; the possibilities to experiment are always there. If you are above 50 and think you are comfortable wearing a bright, bold red, then go for it. If you are 25 and are crushing over that wine toned red, then wear it. Makeup is being creative, so if you haven’t tried scarlet yet, or are afraid to give it a go; then stop wearing and let your red lips do the rest. Nice list! I'm definitely going to look into the NARS Red Lizard, MAC Russian Red, Maybelline Refined wine or YSL Red Muse. Such a helpful post, i love a good red lipstick. Thank you for the wonderful swatches and explanation. Perfect guide... And gorgeous red in yellow dress picture... Which one is that? What a lovely post. I love these reds on you. I don't have many reds but i absolutely love one by Gerard Cosmetics Hydra Matte and Lime Crime Red Velvet. Omggggg, i loveeee the way you do reviews- beautiful picsss, really clear and pretty lipshades!